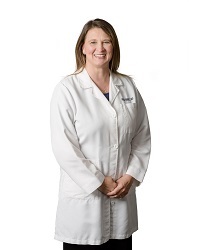 Jacquelin Burke, CNP, is a board certified nurse practitioner in both family medicine and women's health. Jackie has been with the practice for over 2 years and is a welcome addition to the group. Her experience of working 12 years as a labor and delivery nurse with Summa Health Systems is a nice compliment to her care for expectant mothers. It was her experience at Labor and delivery that led her to women's health. Her compassion and love of her work is evident. She has an energetic personality. You just can't help but feel at ease in her presence. You can schedule appointments with Jackie for your well woman exams, pregnancy exams, and exams for birth control counseling or menopause counseling. Jackie allows for same day appointments. Jackie is married and has lived in the area all her life. She enjoys her role of "Mom", in the life of her 2 busy teenage girls. She also enjoys doing DIY home improvement projects. In addition to working as a nurse practitioner, Jackie is also involved in teaching, as an adjunct faculty for the University of Cincinnati's Family Nurse Practitioner distance learning program. Her experience and professionalism are a great match for our team of providers.